Beacon’s easy to use application allows you to receive Motor Club calls directly to your desktop, get quick access to towing instructions, view maps and calls, and much more. 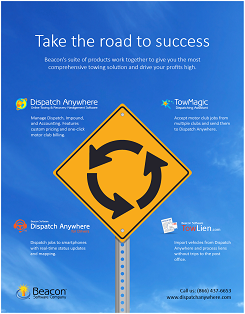 Exclusive to Agero members, receive $100 off the setup of Dispatch Anywhere and/ or 1st month of TowMagic FREE! To receive this special offer, you must give the following promotional code when ordering: CCAS8910PROMO. Manage Dispatch, Impound, and Accounting. Features custom pricing and one-click motor club billing. Accept motor club jobs from multiple clubs and send them to Dispatch Anywhere. Dispatch jobs to smartphones with real-time status updates and mapping.